The external CD/DVD drives we examined are all USB-powered readers and burners (Source). They're often purchased as portable optical drive solutions or to complement newer computers and laptops that lack an integrated CD/DVD drive (Source). Buyers commonly employ them to backup media, install CD/DVD-based software, and perform digital-archiving tasks (Source). The LG Electronics, Dell, ​Forever Stage and VersionTech all burn CDs and DVDs, while the Ammiy (our top Windows pick) only burns to CD. Our top Windows pick, based on the user feedback we've examined, the Ammiy CD/DVD external drive can read/burn CDs, but only read, not burn, DVDs. This unit is white-labeled by a lot of brands- so it goes by a different name in the video below. Our top Macintosh pick is the VersionTech ﻿﻿external drive (see video below). One important note regarding Windows 10 compatibility- a lot of these external optical drives have issues with Windows 10. If you are using Windows 10, with the Ammiy, and the drive doesn't plug-and-play from the get-go, try using VLC Media Player (there are in-depth instructions on the product page). The Ammiy is marketed as an easy way to play and burn games, movies, videos, music CDs and DVDs on single as well as dual layer & DVD Discs. It's compatible with all Windows operating systems platforms including Win XP, VISTA, Windows 7, 8 and 10. Buyers say that this is a light-weight and attractive-looking, Mac USB-CD/DVD burner. It's purely plug and play, without having to install or download any software. It effectively works with both DVDs and CDs (not Blu-rays)- for both playing and burning purposes. The LG portable external DVD/RW drive measures 5.6″ x 0.6″ x 5.4″, and it features USB 2.0 interface, a max 24x CD write speed, and a max 8x DVD±R write speed. Another great feature of this external drive is that you can use it on various operating systems – Windows 8, Windows 7, Vista, XP and more. It also has an m-disc support and a 0.75MB buffer. A reviewer comments that the LG ultra slim portable external drive doesn’t require any installation – you just have to plug it in. He adds that he tried it with Windows 10 and Surface Pro 4, and there were no issues. Another buyer observes that the drive works on a MacBook Pro and that you don’t need any additional software. A purchaser adds that the LG portable DVD drive reads and writes different types of CDs and DVDs effortlessly and that he highly recommends it. However, some customers have said that they had problems playing a DVD on the external drive and that it breaks very quickly. Some users also note that it doesn’t work with their TV and that it looks flimsy. 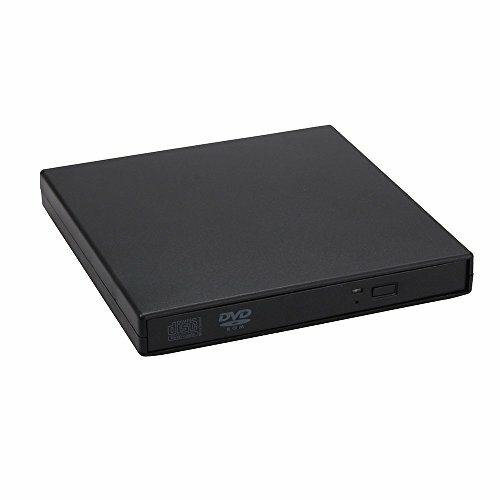 If you need a top-notched external CD drive, then you might spare a moment to take a look at this slim DVD R/W optical drive offered by Dell. Users love the pre-loaded cyber link media suite for playing and burning content, but some do note that it’s not very fast. 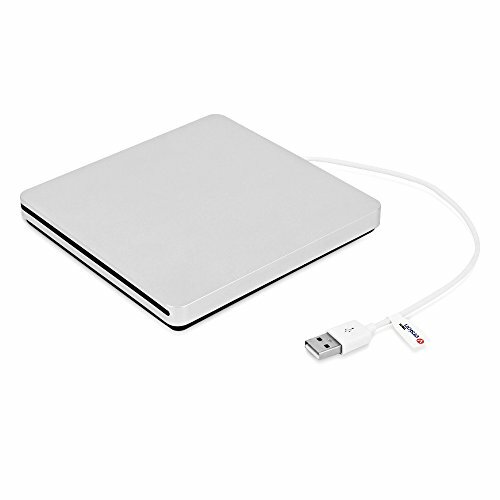 The Dell external DVD drive measures 5.41” x 5.67” x 0.55”, and it features an elegant design and a weight of just 200 g. Another great thing about this external drive is that it’s powered by your USB which eliminates the need for power cords or batteries. 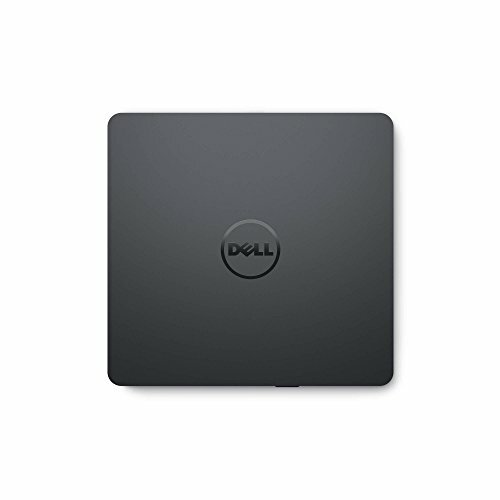 A customer comments that the Dell slim DVD external drive works perfectly on a Mac laptop and that it’s reliable and very well-made. He adds that it’s as quick as an USB drive and that you can use it on Windows 7, 8, and 10. Another reviewer mentions that the drive fits nicely in his traveling bag and that the included cyber link software is very useful and handy. A purchaser states that it’s very easy to install this external USB CD optical drive and that he is extremely pleased with its performance. However, some customers have said that the drive is flimsy, light and slow to burn discs. Some users also say that it worked only for a couple of weeks before it malfunctioned and that the provided software is problematic. This compact external CD drive offered by Ammiy is light, easy to set up, and suitable for anyone that wants to play or burn music and video. Users love that the drive is compatible with all Windows operating systems, but some do note that they had difficulties installing it. The Ammiy external drive for laptops and computers measures 6.7” x 6.2” x 1”, and it features a reading speed of 8x DVD±R/ DVD-ROM, 24x CD-ROM/ CD-R, a writing speed of 8x CD-RW, and a weight of 12.8 ounces. The package also includes one USB data cable and one USB power cable. A reviewer comments that the DVD external drive is small and easy to carry around and that you don’t need to install any special software. The user also says that he uses it both on his laptop and PC regularly and that he still hasn’t encountered any problems. Another buyer comments that he is very impressed with the quality and performance of the drive and he recommends it to anyone looking for an affordable external drive. A user adds that the device has a fast burning speed and that he has burned lots of CDs with a low failure rate. However, some customers have complained that the compact CD external drive doesn’t work on Windows 10 and Mac laptops. A user advises that if you have troubles playing DVDs on a Windows 10 laptop, you should download a VLC media player. This portable external CD drive combo offered by ZSTBT is affordable, easy to setup, and suitable for anyone that wants to burn music or movies to a CD. Users love that the drive is compatible with USB 1.0, but some do note that it’s not suitable for Windows 98/SE and Mac OS. The ZSTBT external drive combo measures 7.5” x 6.4” x 1.6”, and it features a max 8x DVD reading sped, a max 24x CD reading speed, and a max 8x CD burning speed. Also, it weighs only 12.2 ounces, which is great if you want to take it with you on a trip. The package also includes two cables – one data and one power cable. A buyer comments that the CD/DVD external drive works far better than he expected and that he is gladly buying one more for his other computer. The user warns that you might have to download software if you’re using Windows 10. Another reviewer mentions that drive copies files quickly and that it’s solid, well-built and very light. He adds that the instructions are useless, but that’s not a deal-breaker for him. A user also says that the compact portable CD drive is easy to install and that it burns CDs fast and silently. However, some customers have complained that the device doesn’t work or that it doesn’t eject the disc. If you need a reliable external drive for burning CDs or watching DVDs, then you might take a look at his USB external drive burner offered by VersionTech. Users love that this device is specially designed for MacBook, Ultrabook, Netbook, but some do note that there is no eject button. The VersionTech external drive measures 7.2” x 7.2” x 1.3”, and it features a buffer under run protection technology and fast reading and burning speed. Another great thing about this driver is that it’s suitable for Windows 98/SE/ME/2000/XP/VISTA/10/8/7 and MAC OS, and it supports DOS start and system recovery. In general, users have a favorable opinion of the VersionTech USB external CD drive, but they do note some design flaws. A buyer comments that the drive works perfectly with his MacBook Air and that he highly recommends it. He adds that you don’t need any software to use the external drive and that it burns CDs fast. Another purchaser shares that the customer support is very responsive and that they managed to solve his issues with the drive quickly. A reviewer adds that he likes the sleek design of the USB external drive and that it’s so light that you can carry it comfortably in your backpack. However, some customers have said that the drive didn’t work at all and that it’s almost impossible to get the disc out if it gets jammed due to the lack of an eject button. The first external CD & DVD rewriteable drive we examined is produced by LG Electronics- it's 14 mm high and has an 8X right speed for the DVDR and a 24X CD write speed. 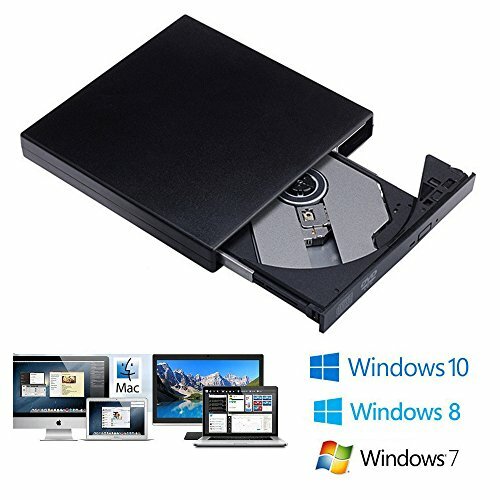 Buyers say that it works with Windows 10 and doesn't require any special Windows drivers to burn DVDs and CDs, even functioning well with older model laptops. A USB-powered option, one reviewer we interviewed employed it with his Surface Pro 2, saying that it was strictly plug-and-play. Another buyer who purchased a new Samsung laptop tells us that since it didn't come equipped with an internal CD or DVD drive that purchasing this electronic accessory was a necessity. As opposed to storing your digital media on the cloud, some buyers prefer to have hardcopy backups of family photo albums, documents, music, and other media. Another reviewer employed it as a boot-up optical drive so that he could install different operating systems on computers and laptops at his IT job. 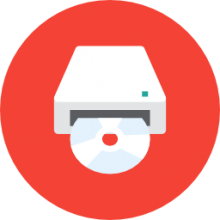 The second external CD/DVD writer we examined is manufactured by Dell- it is a plug and play disc playing and burning solution that plugs into a USB port. It comes equipped with a CD featuring Cyber Link Media Suite Software enabling you to burn and play CDs and DVDs, and even enabling you to install computer programs that come on CDs and DVDs. As well, it's marketed as a portable option- so if you need a mobile solution for on-the-go computing, this lightweight external optical drive is a solid value option. Reviewers endorsed it for desktop computers and laptops, especially since many modern computer hardware setups don't include integrated internal optical drives. It is a PC and Mac compatible solution. There are some complaints, however, with one reviewer saying that once you plug them in, they made a lot of noise, didn't read any of the data and he wasn't able to resolve it by updating Windows drivers. Another buyer had difficulty getting them to read data DVDs, saying that it perpetually grinds without actually reading any of the information on his DVD. Another tech professional tells us that he experienced similar difficulties, that it is a slow optical drive that vibrates and noisily grinds. The third external CD/DVD reader and burner we examined is provided by Ammiy. It's marketed as a solution for playing or burning, music, movies, videos and games- compatible with Windows XP, Vista, 7, 8 and 10. As a USB powered option, it's designed to work with desktops, notebooks, netbooks, and laptops. Some buyers employed it to install legacy antivirus software on their computers. Other home computer users tell us that it is a lightweight and portable option, enabling buyers to transport it around to friend and coworker computer stations to perform updates or transfer data. Some buyers had difficulty getting it to work with windows 10-though there is a workaround if you use the VLC media player. The fourth external Blu-ray drive we examined is manufactured by ForeverStage. The manufacturer advises that you don't situate your external optical drive near magnetic objects, always place it on a stable surface area and never look at the laser light directly. Buyers have had some compatibility issues getting it to work with Windows 10- the reviewers are careful to say that it is not the device's fault and that you will likely need to download third-party software to get it working correctly. One Toshiba computer user says that he has been pleased with its functionality- saying that it runs quietly when ripping audio CDs- it's the best cd ripper he is used, in fact. The last external disk drive we examined his VersionTech option- this one, like the others, is USB-powered, is plug-and-play, and is engineered to be compatible with Mac as well as Windows computers. It doesn't work with Blu-ray's, however. One MacBook air owner says it seamlessly integrated with their computer. Buyers are also impressed by its design- its silver color matches their Macintosh computers and has been an effective complement for laptops that lack external optical drives or have internal CD and DVD burners that have flagged with age.